I spent a good bit of the day outside getting things put away from the summer, and cleaning out the garden for winter. It is sad alittle. I do like fall. But in the midst of my thoughts about all the clean up I had, there were three flowers, outside of my mums, that were still in bloom, looking at me to almost say.."hey, I am still here." When the chores were done, and I was able to get back into my craft cave, I put this together. 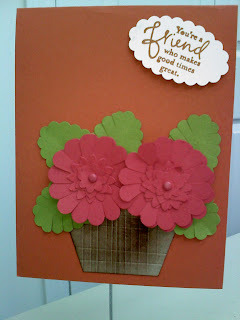 If it hadn't been getting so dark I would have taken a picture of the card with the flowers that inspired me so. I used the LNS Challenge 42 - Color challenge to complete the card. Its unbelieveable how many scraps I 'used' to put this together, but I am liking it. Ingredients: Scalloped Circle Punch- Ruby Red CS, Boho flowers Punch- Ruby Red CS, Scalloped oval Punch- Old Olive CS, Kraft flower pot base.